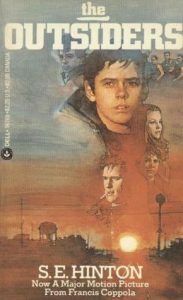 Ponyboy is the fourteen year old narrator of the Outsiders. He is the story’s main protagonist, and the youngest member of the greasers. His keen interest in literature and strong academic prowess set him apart from the rest of his friends. Since the death of his parents, Ponyboy has lived with his brothers Darry and Sodapop. Darry continually accuses Ponyboy of having little common sense, even so, Ponyboy is an observant and reliable narrator. As the story progresses, it becomes more and more evident how much Ponyboy struggles with social class division, violence, innocence and brotherly love. As he matures, he begins to recognize the importance of remaining steadfast in the face of adversity. Darrel, or Darry, is Ponyboy’s oldest brother and guardian. He is a twenty year old greaser, now tasked with the responsibility of raising his two younger brothers. He is athletic, strong and extremely smart. Darry was forced to leave school in order to work multiple jobs to provide for his brothers. He is the unofficial leader of the greasers, whom they often refer to as ‘Superman.’ He makes excellent chocolate cake, something he and his brothers eat daily for breakfast. The middle of the Curtis brothers, Sodapop is equally as handsome as his brothers. He is always happy, and plans to marry Sandy – a female greaser. The ‘class-clown’ of the group, Two-Bit is always joking around. He is also a wise-cracking shoplifter, who carries around a black handled switchblade. He prompts a riff with the Socs by flirting with Marcia. Steve has been Sodapop’s best friend since elementary school. He is a seventeen year old member of the greasers who works at the gas station alongside Sodapop. Steve is an expert when it comes to cars, and enjoys stealing hubcaps. He is coy, smart and tall. He is also extremely tough – he once fought of four attackers with a broken pop bottle. He isn’t much of a fan of Ponyboy. Dallas is the toughest of the bunch, he is referred to as ‘Dally”. Despite being a hardened young man who used to run with real gangs in New York, he does not subscribe to the same greasy appearance as his friends. Even still, he is the most violent of the bunch, and has a lengthy criminal record. Dally is extremely protective of Johnny. Johnny is a sixteen year old, who despite being highly intellectual, does not do well in school. His parents are abusive and struggle with alcohol addiction, prompting him to see the greasers as his only real family. The older boys are especially protective of him because of his vulnerabilities. Sandy is the girlfriend of Sodapop. Pregnant with another man’s child, she moves to Florida to live with her grandmother. Similar to the other female greasers, she only appears in the story when the males mention her. Cherry is Bob’s girlfriend. Her real name is Sherri, but she is called Cherry on account of her red hair. Marcia is Randy’s girlfriend and a friend of Cherry. Randy is Marcia’s boyfriend and Bob’s best friend. Randy eventually sees that not all fights are worth having, and later goes on to humanize the Socs by expressing that many of them have redeeming qualities. Bob is Cherry’s boyfriend, He wears three heavy rings that he uses to fight greasers. Bob is killed by Johnny.